Our facial treatments are customised to treat your individual skincare concerns. We will help you choose which of our product ranges and equipment options that is most suitable for you. The conditions that we can address include: Aging, Oily/Acne, Dry/Dehydrated, Couperose/Redness, Sensitivity, Pigmentation, Tired/Dull and Sun damage. All our facial treatments are implemented with Dermalogica Skincare which we customise to treat your individual skincare needs. A complete facial treatment to provide maximum results in minimum time. The signature treatment begins with a deep power cleanse, followed by an exfoliation to reveal smooth glowing skin. A customised and blended professional serum will be applied for preparation of the prescribed intensive masque therapy. Your signature treatment is completed with applying a nutrient rich moisturising barrier, which will protect and help restore the natural balance of your skin. 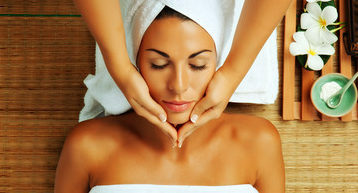 The facial that has all the benefits of relaxation, treatment and indulgence. The Pro Skin 60 facial includes all the standards of European facial treatment with professional extractions performed if needed, a professional serum will be applied to the face, neck and décolletage followed by a 15 minute massage to these areas. The facial is completed with the application of a customised masque. and moisturiser. Based on the specialist consultation, you may choose to add one or multiple of the TOUCH THERAPIES to any of Facial Treatment for a synergistic results. Dermalogica's Pro Power Peel provides a peel system that is fully customised to your needs in each treatment targeting a broad range of skin concerns. 30% Glycolic Acid - reduces the appearances of hyperpigmentation, while minimising the appearances of fine lines and wrinkles. Power Clear Peel - targets blemishes, post-inflammatory hyperpigmentation and redness.